Originated at the Jacob-Makoy Nursery, Liège, Belgium, and named for their head gardener. Illustration; From the first publication, by Professor and botanist Charles Morren, ed. 1868, Belgique Horticole, p.257, pl.15. Commentary; Marc de Coninck, Belgium, 2012. Possibly a genetically variegated leaf sport of ‘Chandleri’. It is the only known Belgian camellia with genetic variegation in the leaves. Over the years has acquired the incorrect synonyms ‘Lady of the Lake’ and ‘Lady of the Lake’ (Australia). Incorrectly published in the first ICS Register, 1993, as ‘Françoise Wiot. 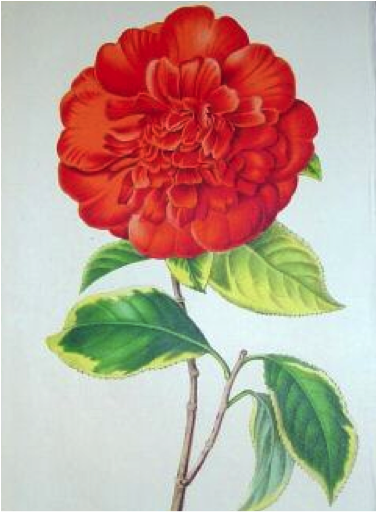 This camellia had disappeared from Europe, but was reintroduced with the precious help of the late Dr R.M. Withers, Donvale, Victoria, Australia in 2003, and later with further scions from Neil and Jean Saltmarsh, Warragul, Victoria. ‘Francois Wiot’ will soon join our National Belgian Camellia Collection at the Provincial Domain ‘Het Leen’ in Eeklo. It is also part of the Australian ‘Camellia Ark Project’. Location of long established plant; Royal Botanic Gardens, Melbourne, Australia.